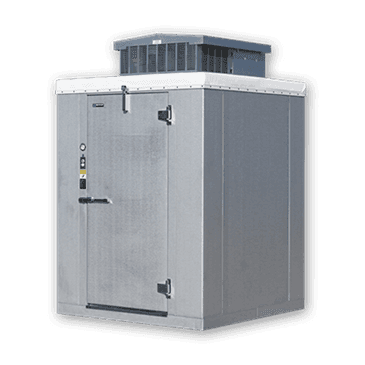 Master-Bilt Products MB5861010COX (QUICK SHIP) OUTDOOR Walk-In Cooler 9'-8" x 9'-8" x 8'-6"
You will earn 8,918 Reward Points. Earn 1 reward point for every 1 dollar spent. Walk-ins will be constructed of prefab, precision formed, modular panels designed for accurate, rapid field assembly and in compliance with the general construction as described in the Master-Bilt Architectural Specifications and General Design Information binder. 4" thick rigid polyurethane, pour-type, foamed-in-place. Interior and exterior wall and roof finish of walk-in coolers and freezers is 26 gauge acrylic coated stucco galvanized steel. Floor interior finish is .080 textured aluminum. Floor panels are designed to support an evenly distributed load of 700 lbs. per square foot loading (stationary load). PRS-2 series refrigeration systems consist of a condensing unit and evaporator coil fully assembled inside a mill finish aluminum housing. Each system provided wired, piped, evacuated, optimally charged and run tested. All models are ready to mount on top of a Master-Bilt walk-in cooler or freezer. PRS-2 systems may be specified for compartments 13'6" long and under. Some indoor models will be provided with power cord for direct plug in to receptacle. Indoor models also supplied with a condensate evaporator pan. Additionally, systems will contain a factory mounted diffuser with trim pieces provided loose for finishing box opening on inside. The evaporator grille is designed to mount flush or recessed within a 4" thick ceiling panel. Systems for medium temperature applications are air defrost. Low temperature models feature electric defrost. All units contain R-404A refrigerant and are designed to operate in ambient temperatures up to 100°F. Systems for outdoor walk-ins also contain a crankcase heater, drainline heater, head master and weather hood. 18 months limited parts and labor and extended four year compressor warranty. Panels are covered for 15 years. PRS-2 refrigeration is sized for holding duty only. If the ambient is higher than 100 degrees F or pull down capacity is required, a regular (non-Quick Ship) quote will be needed. Coolers are designed for +35 degree room temperature with 90 degree ambient and 100 degree temperature at condensing unit. Less floor coolers assumed no insulation under floor slab. Master-Bilt Products MB5861012COX (QUICK SHIP) OUTDOOR Walk-In Cooler 9'-8" x 11'-7" x 8'-6"
Master-Bilt Products MB5861010CIX (QUICK SHIP) INDOOR Walk-In Cooler 9'-8" x 9'-8" x 8'-6"
Master-Bilt Products MB5821010COX (QUICK SHIP) OUTDOOR Walk-In Cooler 9'-8" x 9'-8" x 8'-2"
Master-Bilt Products MB5860610COX (QUICK SHIP) OUTDOOR Walk-In Cooler 5'-10" x 9'-8" x 8'-6"
Master-Bilt Products MB5760606CIX (QUICK SHIP) INDOOR Walk-In Cooler 5'-10" x 5'-10" x 7'-6"
Master-Bilt Products MB5820610COX (QUICK SHIP) OUTDOOR Walk-In Cooler 5'-10" x 9'-8" x 8'-2"
Products MB5861010COX (QUICK SHIP) OUTDOOR Walk-In Cooler 9'-8" x 9'-8" x 8'-6"